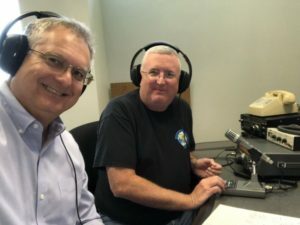 If you’ve ever been to an Arizona/Phoenix area hamfest you’ve likely seen Patrick Stoddard (WD9EWK) running the AMSAT booth and performing demonstrations as satellites pass over. If you’ve ever chased grids on or casually worked satellites there’s a high probability you’ve had a QSO with Patrick. Patrick routinely activates grids wherever his travels take him and posts his pass schedule on the AMSAT-BB and via his Twitter account.  I noticed on Sunday afternoon that Patrick was nearby in Louisiana activating grids and his travel was bringing him to Houston to catch his departing flight back home. If time would permit, this would be a great time to put a face to a voice I’ve heard for so long. 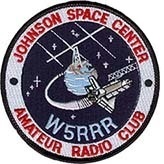 John (AB5SS) began working to coordinate lunch, a W5RRR shack tour, and a little time to work a few passes. Unfortunately, as the lunch hour approached on Monday, duty called and I wasn’t able to get away from work to meet Patrick. Patrick (WD9EWK) and John (AB5SS) working satellites at W5RRR. 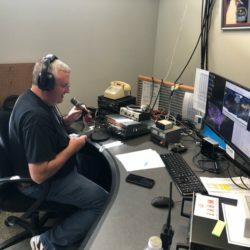 John was able to continue to carry the torch and give Patrick a tour of the W5RRR shack, work a couple satellite passes, and then grab a quick lunch. Patrick was able to work AO-91 and CAS-4A. Although working under the W5RRR callsign, several regular satellite operators immediately recognized Patrick’s voice! Thanks to Patrick for juggling his schedule to make the trip down to the Webster area for a face-to-face QSO. I hope to catch you on your next pass through Houston and I will definitely catch you in the next grid you activate!